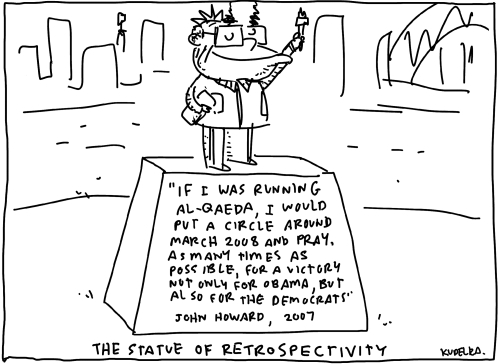 There didn’t seem to be a place for this cartoon all week and it’s probably passed its use-by date, which is a pity because I do think that The Sculpture Garden Of Things Which In Retrospect People In Public Life Probably Wish They Hadn’t Said would be a salutory experience for us all. It would certainly make twitter a more exciting place, though the world would probably run out of marble in a hurry. Anyway, the little fella’s contribution to the 2008 US election campaign deserves another airing in light of the circumstances of last week, so here it is. Did he really say that? I am gobsmacked!